Doctors work to improve health and well-being at individual and societal levels. This can mean different things — from diagnosing a source of pain or disease and prescribing medication to launching a local to a stop-smoking campaign. A doctor diagnoses illnesses and treats injuries by examining patients, performing procedures, taking medical histories, prescribing medications, and conducting tests. In order to prevent patients from getting sick, doctors may also advise them on preventive health care, diet, and exercise. While general practice doctors will assess patients’ overall health, many doctors specialize in a specific area, such as cardiology, neurology, orthopedics, or pediatrics. The potential for high income as a physician is strong; the mean annual salary for physicians and surgeons, according to the U.S. Bureau of Labor Statistics in 2015 was $197,700. However, because of the long education and training demands, becoming a successful doctor can take a long time. Work hours are extremely long and doctors will likely have to work nights and weekends in addition to regular business hours. If you are a private practice physician, you’ll be able to have more control over your schedule than those working in hospitals. To become a doctor, you are required to obtain a medical degree or Ph.D. Undergraduate work should be in a scientific field. After medical school, you must complete a residency and you will be required to obtain a license to practice medicine. Key skills that will help you as a doctor include strong medical skills, dexterity to perform procedures, stamina to make rounds, problem-solving ability, possess patience, attention to detail and interpersonal skills. There is no specific major that prospective doctors need to pursue before enrolling in medical school. However, it’s important that students take various science and science-related courses. Examples of majors may include chemistry, physics, and biology. Some colleges and universities may even offer a pre-medicine track that will include courses in anatomy and physiology. While in school, it is helpful to work in a medical facility. Admission into medical school is very competitive, and it’s important that applicants look for any possible advantage. 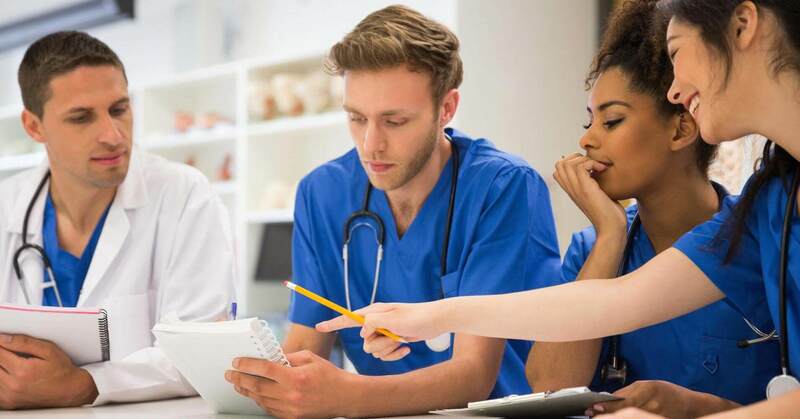 While a strong grade point average is important, volunteering at a local health clinic or working in a medical facility may be beneficial since it adds to the extracurricular activities that you can list on a medical school application. Also, you should get letters of recommendation. Medical schools sometimes require these, but it’s important for you to get them even if they aren’t a prerequisite. You should build strong relationships with professors in the pre-med track to get positive letters of recommendation. Medical schools require that individuals interested in applying take the Medical College Admission Test (MCAT). This is a multiple-choice exam that covers areas involving critical thinking, problem-solving, scientific principles and writing. It’s important to perform well on this exam in order to get accepted into medical school. A Doctor of Medicine (MD) program is four years in length and combines academic coursework with clinical training. The first two years of the program will teach you about several topics, including medical laws and ethics, microbiology, anatomy, and physiology. The final two years require you to practice in clinical rotations. These rotations, completed under the supervision of doctors, will expose students to areas involving surgery, pediatrics, internal medicine, psychiatry, gynecology, and obstetrics. Consider also participating in an internship. Medical students will be expected to choose internships that focus on a specific specialty. This will help them get into a residency program. The internship is often completed during the summer between the third and fourth years. After graduating from medical school, aspiring doctors must enter residency programs. In a residency, doctors will receive paid, on-the-job training. These can last anywhere from 3-7 years, depending on the specialty. They take place in a hospital and offer an opportunity for medical school graduates to begin treating patients under the supervision of an experienced doctor. This three-part exam covers topics involving scientific and medical concepts, patient care and management in ambulatory settings. You may also consider obtaining specialty certification. You have the option to earn certification in the specialty of your interest from an accredited organization. Earning certification will demonstrate a candidate’s knowledge and skills in a specific medical specialty, such as immunology, dermatology, neurological surgery or ophthalmology. The prerequisites for certification typically include a certain number of years of experience working in the specialty, including the residency period, and passing an exam.